PROGRA2 instruments are imaging polarimeters with two randomly polarized lasers at 632.8 and 543.5 nm. The laser beam carried by optical fibers illuminates the agglomerates. Light scattered by samples at a given scattering angle is split between the parallel component and the perpendicular component by a beam splitter cube. 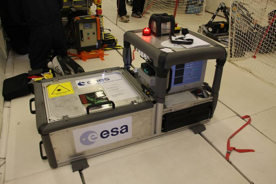 The cube is followed by the detectors: two CCD cameras providing 25 images per second. PROGRA2-vis observes the levitating agglomerates lifted by a small injection of nitrogen in a vial. The incident laser beam and vial rotate and the detection system is fixed. The size of the agglomerates having diameter greater than 20 mm can be detected on the images recorded by the instrument. PROGRA2-surf performed the measurement for deposited agglomerates on a surface. Results from tens of images are necessary to be averaged in order to obtain the typical errors of the PROGRA2 instrument. These errors are of about 1% (in absolute value) for polarization and 10% (in relative values) for the brightness. More details of the instruments are presented in Renard et al. and Hadamcik et al. .
where Iper and Ipar are respectively the perpendicular and parallel components polarized to the scattering plane. The imaging system and the more sensitive cameras allow sorting out the polarization values per different agglomerates size classes in order to estimate the size effect on the polarization for the same absorbing sample.